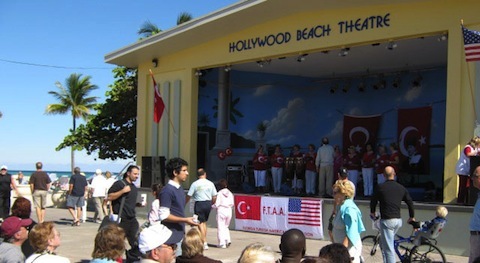 The Florida Turkish American Association (FTAA) organizes the 13th Annual Florida Turkish Festival on Sunday, April 19, 2015 from 12:00 noon to 8:00 p.m. at Arts Park, Young Circle, Hollywood, Florida. The festival is free of charge and open to the general public. The purpose of the festival is to promote Turkey with its rich and diverse culture. It is FTAA’s goal to give guests the opportunity to discover, celebrate, and savor Turkish hospitality, culture, and cuisine. The theme of this year’s festival will be “Broward Goes Turkish.” Different aspects of Turkey’s varied heritage will be presented from different regions of Turkey. It will be filled with a variety of events demonstrating Turkish culture, arts, cuisine, fashion, and connections with the American people. The festival’s highlights will include performances by folk dance groups performing Turkey’s famous traditional and distinctive dances, live Turkish music, and belly dancing. It will offer delicious Turkish food for purchase such as doner kebab, borek (cheese and spinach filled pastry), baklava, and Turkish coffee, just to name a few of the delicacies. There will be traditional fortune tellers reading coffee grinds in the special coffee tent. Demonstrations of Turkish art will give guests the opportunity to purchase these unique and popular forms of Turkish arts and crafts. Free children’s activities will include face painting, balloon sculpting, and a bounce house making the festival a family affair.